Showing for at least their third year in a row, ETCF is still a solid fangame. ETCF has had a long history with the expo. Having founded SAGE, I’ve been here since the start, and I can remember seeing ETCF at SAGE for probably the last three years. The latest showing from Chao Killer Team remains a solid entry, if a little unremarkable. The demo consists of two levels and one boss; the first level is the old mainstay, the stage we’ve been seeing since its first year at SAGE – “Sparkling Seaside”. It seems the level has been touched up quite a bit since I last remember seeing it. There’s at least one new enemy roaming around the level and a number of new secret areas and routes to take. Despite this, however, the level does come off feeling sort of… I dunno, dated. A lot of fangames (and I’m probably just as guilty of this as anybody) seem to trip up with regards to creating new enemies to populate their levels; they never seem to have the clear-cut functionality, and Sparkling Seaside definitely suffers from this. There’s a very weird sort of… bee enemy… thing that’s been kicking around in that level since the first showing of ETCF with fanblades underneath its body. 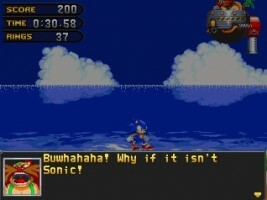 When it is on screen, it simply flies at Sonic until it hits him. The robot’s design is confusing enough, but patterned with how it attacks, it just feels… awkward. Punctuating the end of Sparkling Seaside is a boss encounter with Dr. Eggman, who appears to be dressed in a lovely neon green muscle shirt (offering up a nice bit of character). Unfortunately, the boss fight that follows is slow and plodding – the epitome of the “wait around to attack” boss fight, Dr. Eggman will fly around the screen just out of your reach dropping coconuts, as it begins to rain continually harder. Suddenly, lightning will flash, and as the flash fades away Eggman will be low enough to attack – but only for a moment, as he quickly retreats back in to the sky once again where he begins dropping more coconuts. To put this simply, it’s the opposite of exciting – you basically stand around waiting for a blatant opening, bonk him a couple of times, and wait for another opening. While one could make the excuse that this is because it’s the boss for the first level, take in to consideration official Sonic bosses; Green Hill Zone’s boss, Emerald Hill, Angel Island, Mushroom Hill… if any of these bosses made you wait to do anything, it was never for more than a couple of seconds. 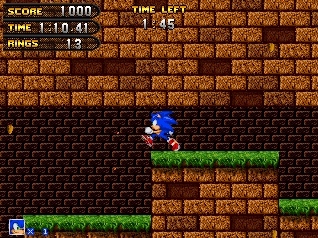 Moving on to the next level, we are presented with “Relic Retreat”, which takes Sonic on a run through yet another set of forgotten ruins – this isn’t a dig on ETCF, by the way; Sonic, even in the official games, just seems naturally attracted to ancient ruins. It’s weird. 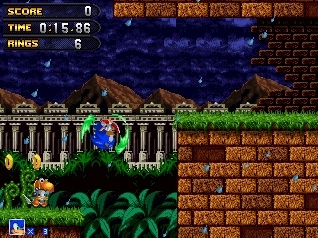 “Relic Retreat” takes its design cues from quite a wide variety of Sonic’s other ventures in to ancient ruins, with elements of Marble Zone, Marble Garden Zone, Sonic 2’s Hidden Palace Zone and even Sonic 3D Blast’s Rusty Ruins Zone. 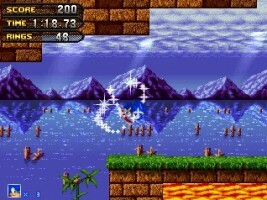 Though a much more solid experience than “Sparkling Seaside” (thanks in part to earthquake-controlling switches that open up new pathways, and destructable floors that lead to secret items), it, too, suffers from weird enemy implementation – bats that curl up and drill at the player diagonally and orange dinosaurs that seem small and move almost a little too quickly. They aren’t terrible by any means, it just feels sort of tricky to manuver around them in a bad way. Like you’re never quite sure where they’re about to be. That being said, they never really caused any unfair hits, persay – so maybe I’m just being overly paranoid. The demo ends with a chase sequence that reminds me of something out of a Metroid game; everything starts rumbling and Sonic takes that as his cue to get out – which prompts a timer to come up counting down to some sort of doomed fate. Why an earthquake elicits a countdown is kind of weird when you really stop and think about it, but the sequence is cool, none the less – tasking players to retreat through the same means they entered the ruins through, and beyond, eventually triggering a giant boulder that chases Sonic down the hallway, Indiana Jones style. 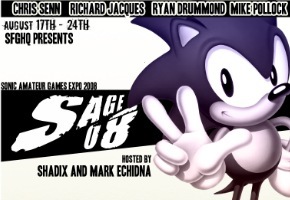 I’ve come to notice, primarily at an event like SAGE, it becomes rather tiresome seeing dozens and dozens of Sega Genesis styled Sonic clones that don’t try to do anything to separate each other from the pack. Mecha Madness on Friday was a breath of fresh air with it’s heavier focus on combat and RPG-styled skill upgrades. 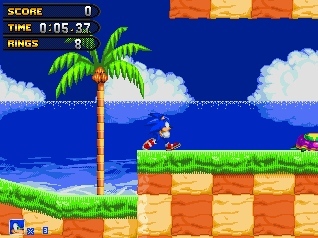 ETCF approaches the edge of “Sega Genesis styled Sonic clone” – but it never quite goes over, thanks in part to moments like the escape scene at the end of “Relic Retreat” Act 2. 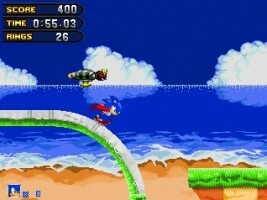 The unique visual style also helps elevate it above the rest, too – a customised Sonic sprite definitely makes the game stand apart from the scores of fangames out there that simply re-use a mish-mash of Sega Genesis Sonic sprites. All of that being said, though, while there’s nothing wrong with ETCF, it doesn’t quite reach the bar set by games like Sonic XG. Then again, not many games here at SAGE can. It is what it is, and while Emerald Ties: Crossing Fates may not be perfect, but it has enough to make it stand out from the crowd. It’s alright in my book. Check it out.